First look at 2015 Volkswagen Passat | What Car? 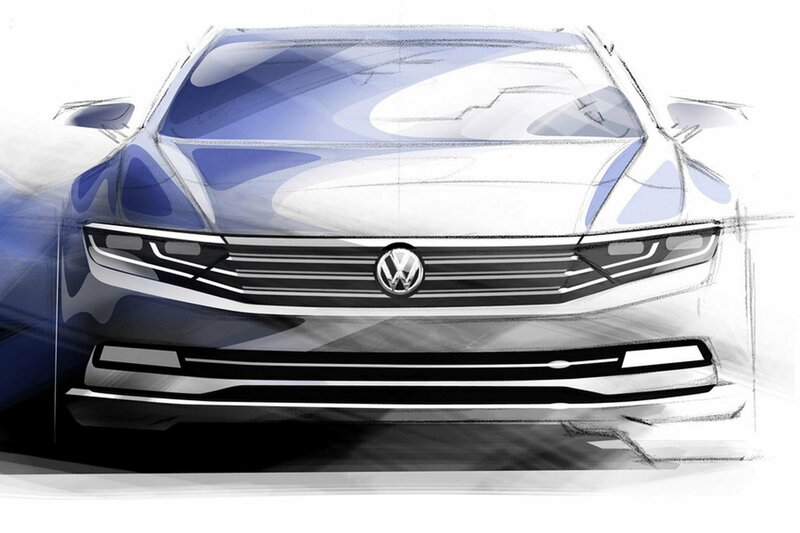 These are the first official design sketches of the new Volkswagen Passat, which is shorter and lower than the current car, and goes on sale next year with a range of new engines. The sketches show a sleek, single-frame grille and headlight unit that has chunky chrome horizontal slats. The waistline crease is much sharper than on the current car, and the sketches hint at a chrome finish to the front diffuser, side skirts and rear bumper. Two wide, flat exhaust tailpipes are integrated into the wraparound rear. VW has revealed that the revised range of engines will include four diesels with power outputs ranging from 118bhp to 238bhp, and six petrols with outputs of 123bhp up to 276bhp. The 238bhp diesel produces 369lb ft of torque and is mated to a seven-speed dual-clutch automatic gearbox with four-wheel drive as standard. Elsewhere, a 134bhp petrol will have cylinder-deactivation technology to boost fuel economy. All versions of the Passat will have more space than their predecessors, with the estate version offering a 650-litre boot and 40/20/40-split folding rear seats. Two versions of the new Passat will be revealed at the Paris motor show in October - a four-door saloon and a five-door hatch, which will both be available from launch. Both are expected to be sold in the UK.